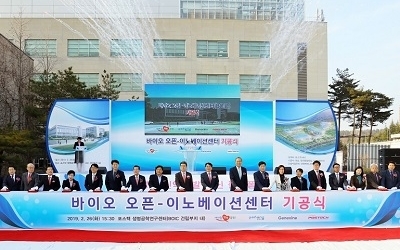 POSTECH’s most noble founding principle and mission is to become a University that will serve the nation and humanity. The mission is also the obligation of POSTECHIANs. For students to realize and exercise their mission – to cultivate their natural talent and to make the world a better place – and to grow as true global leaders, POSTECH runs a variety of volunteer service programs. POSTECH members take the initiative in realizing the value of sharing through persistent and diverse volunteer activities – passionate knowledge services (RC Corps), aid services for disabled people (freshman orientation service), the youth science classroom for relatively underprivileged regions (POSTECH Knowledge Service Club, Learning Value), etc. Having consistently exercised the popularization of such science and educational donations, POSTECH garnered awards including the volunteer grand festival bronze prize in 2009, Korea educational donation grand prize in 2012 and so on. The “We Share the Future” project in Ethiopia was first implemented by POSTECH during the 2012 winter vacation with the support of Woori Bank. Students learn valuable lessons in taking care of the less fortunate and contributing to society and humanity through hands-on activities befitting the nature of a university that specializes in science and engineering – science-focused educational services, labor services, appropriate technology applications and more. This project aims to help those in need and at the same time to inspire students to be upright individuals with a sense of responsibility required to be future global leaders. The advancement of science and technology is directly related to the growth of a nation. POSTECH helped to establish the Materials Engineering Department at Adama Science and Technology University (AUST), Ethiopia’s first science and technology university. The department, which was established with the fruitful support of scholars from POSTECH, is the very first department related to materials engineering in the history of Ethiopia. POSTECH’s experimental equipment and educational know-how will serve as a solid foundation where our ally nation Ethiopia can develop advanced science education.